Yes, you read that right. Our family LOVES these cucumbers. Extremely simple. Only three ingredients. Tonight, I came home from work late and I stopped at the store before coming home. It is spring here and that means it is time for summer type food. I saw the English cucumbers and just had to get some. 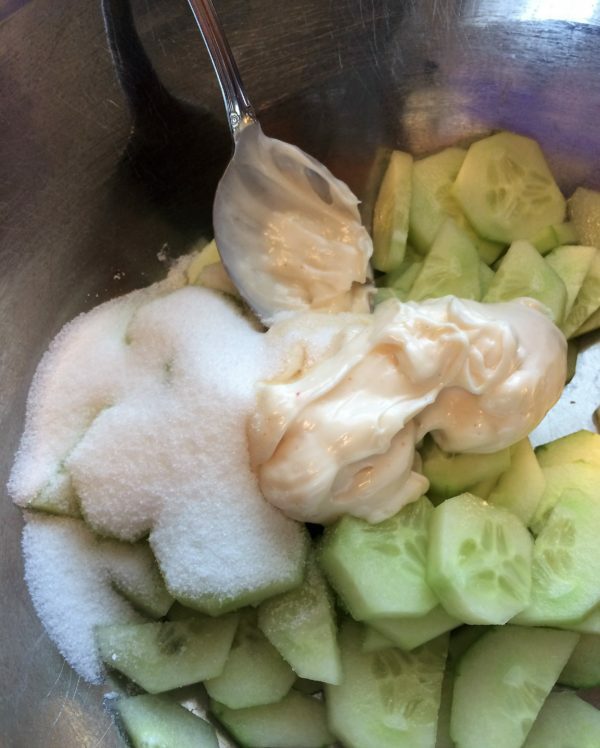 My daughter chose cucumbers over pizza tonight…we haven’t had these for a few months now. What a treat. This post contains affiliate links. Which means that I will receive a small commission if you purchase anything from one of my links. However, it does not affect your purchase price. To learn more, please see my about us page. Do you use Pinterest? Do you want to make money from Pinning on Pinterest? Learn from an expert here. I just happen to like them better because they have a thinner skin and smaller seeds. I also like the uniformity of the cucumber. The more common cucumber seen in the store is normally thicker skinned and waxed to keep it from drying out. The English cucumber is the one that is shrink wrapped in plastic. I believe that is to protect it a bit more because the skin is thinner than the more common cucumber that you would put in a plastic bag at the store. Often those cucumbers I will peel, cut in half, and cut out the seeds as I think the seeds are too big for my preference. Do you have a blog? Here is a great resource for blogging for profit. She provides real resources and step-be-step help. It is a must have if you are a blogger. Get it now here. Affiliates are also a great way to make money blogging. Don’t go it alone! Take some time and learn from an expert. Here is an amazing ebook on the subject! Well, I must admit, I do not like creamed cucumbers with dill, or vinegar, or cream, or milk. I am sorry if I have offended someone. It is just my taste buds talking. So, I made this recipe many years ago and it has become a family favorite. 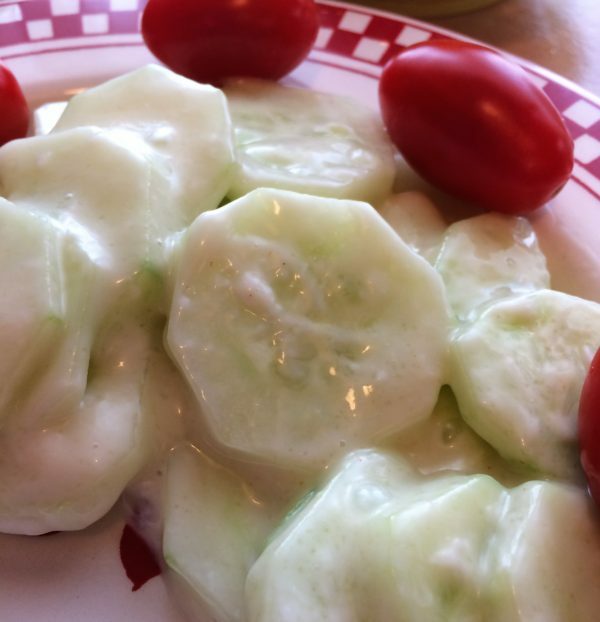 These creamy cucumbers with Miracle Whip can be done in a snap and are great for an appetizer, side dish, salad, potluck. They do last about 1 day in the refrigerator. I am not sure beyond that as they just do not last in my house that long. I also like to have cherry tomatoes with mine. The rest of the family does not, but I do. So, I show in the picture how I eat mine with the cherry tomatoes on the side. I think it looks a bit fancier. You are probably thinking. Wow! this lady is opinionated about food. I guess I am a bit. However, I am only sharing recipes with you that my family and I like. I hope you and your family does too. This is really a cool way to make your cold brew iced tea! Put the tea in the insert and enjoy. Love the shape of these bowls. Creamy cucumbers that are extremely easy to make. They taste so good, we eat them by the bowl full. The English cucumbers come in the shrink wrap plastic. Remove the plastic and peel the green skin. I think if you don't remove the skin, it gives the cucumbers a bitter taste. Slice the cucumbers thinly. If some of the slices seem kind of big, you can cut them in half as well to make it easier to eat. Add the Miracle Whip and Sugar. Stir. Let sit about 3 minutes for the sugar to dissolve. Enjoy! Variation: I think you could actually add onions, green peppers, or another type of vegetable that you like. Remember to make recipes something you like. Here is a picture the way I like it. Looks good. I.love cucumbers and l am going to make this. Thank you. I can eat a whole cucumber with this sauce. I do love to have the cherry tomatoes with it too. Sometimes, when tomatoes are in season from the garden, I will cut up a beef steak tomato and add that to the cucumber and sauce. Enjoy! They truly are. I hope you give this recipe a try.